On Sunday, 25th November, during Evensong in St Fin Barre’s Cathedral, Cork, the Bishop of Cork, Dr Paul Colton, licensed two new Readers to serve in the Diocese. Maia Paulus and Andrew Coleman were licensed, having completed one of the courses approved by the House of Bishops, namely the Certificate in Christian Studies validated by the Pontifical University at Maynooth. There are three others from the Diocese currently working towards completion of the course and licensing as Readers. The Certificate in Christian Studies is now also being delivered in Cork with 22 participants. Details of the Certificate may be found HERE. Also at the Service yesterday, the Bishop commissioned the Reverend Paul Arbuthnot to serve as Chaplain to the Guild of Lay Ministers in the Diocese. The Guild includes all the Readers, as well as Local Lay Ministers of which there are 5 liturgical assistants and 7 pastoral assistants. 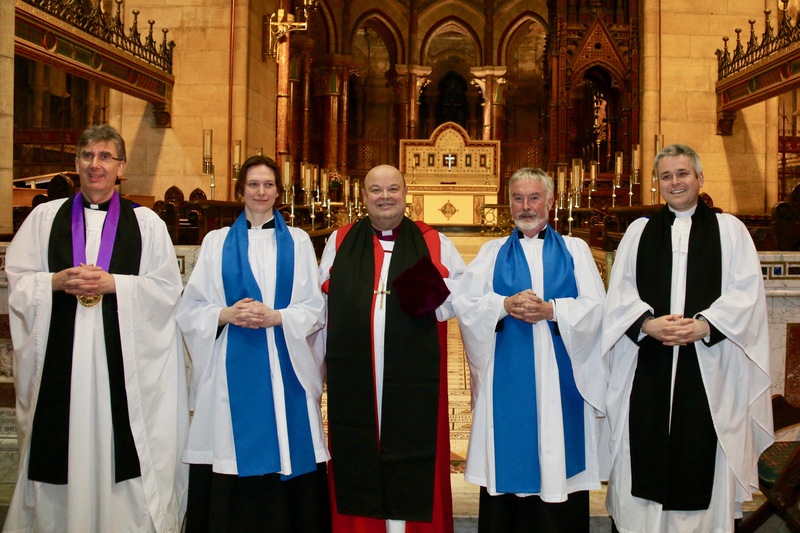 Pictured following the licensing of two new Readers were (l-R) the Dean of Cork, the Very Reverend Nigel DUnne, Maia Paulus, the Bishop, Andrew Coleman, and the Reverend Paul Arbuthnot (Chaplain to the Guild of Lay Ministers). This entry was posted in Bishop, Cathedral, Commissionings, Diocesan Readers, Lay Ministry, LIcensing. Bookmark the permalink.